A company based in Israel called DouxMatok has come up with a novel way to reduce sugar intake without using either artificial or low calorie sweeteners. Basically they coat tiny food grade particles with sucrose (ordinary sugar) to produce a product that tastes just like sugar, but with half the calories. The micron substance used as a base is already approved and in use in the food industry. Can be used anywhere sugar is used. Soft drinks, candy, chocolate and ice cream would be obvious candidates, but a table top sweetener could also possibly be developed. Half the calories and half the sugar. The only issue would be the carrier or flavor delivery agent. It is an approved food grade mineral. No further information is yet forthcoming, but likely it will be a benign and common substance. Not much information yet available. DouxMatok are promising that it will be slightly cheaper, per unit of sweetness, than sugar. This is a completely new approach to the issue of sugar reduction. Food engineering is beginning increasingly important in the delivery of nutrition, shelf life, mouth feel, texture and taste. Some consumers will resist this trend, preferring natural substances. Nevertheless, products like protein bars have taken off in recent years and the trend is set to continue. This novel new approach of delivering 100% taste with 50% of the substance by tricking the taste buds holds huge promise, and not just for sugar. Salt is a big issue for many consumers. Until now there has been no good salt substitute. This could all change with this new coating technique. New approach to the important issue of sugar reduction without the usual drawbacks of other sweeteners. Remains to be seen if the product will take off. 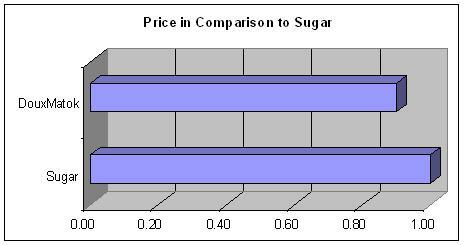 However the upside potential is greater than the sweetener market alone and has profound implications for food science. Note: The above is based on preliminary data and likely to change when more product information becomes available.